Nonsense arguments, but they’re pervasive. Know how to counter them! For those who are pro-choice, there seem to be two main lines of argumentative thinking. Many believe that abortion is a right of the mother because the fetus is not a baby or, more specifically, not a human being. Others believe that the fetus is a human being but that, however, a fetus is not a person under the law, therefore the fetus does not have any rights. Both views are flawed. A fetus is not yet a human being. It is nothing but a clump of cells with the potential to become a human being. It is ‘alive,’ but that is also true of all the other cells in a woman’s body. It has no life of its own yet. It is not yet a separate life from the life of the woman in whose uterus it is. But a “human being” is defined as “any individual of the genus Homo, especially a member of the species Homo sapiens; a person, especially as distinguished from other animals or as representing the human species.” There isn’t a definition of “human being” that excludes the unborn. Is it true that a fetus is a form of life? Of course it is. It is made up of live cells, it is growing and processing energy, it has the capacity to mature and reproduce, it has a genetic system and so on. Will an abortion destroy this form of life? Yes, absolutely. Well then, isn’t an abortion killing another human being? No, absolutely not. A fetus is not yet a human being. It is more like a seed or a sprout of a human being. First, born children have the “capacity to mature and reproduce.” but they haven’t reached that stage of development yet. Does that make a 10-year-old less human? 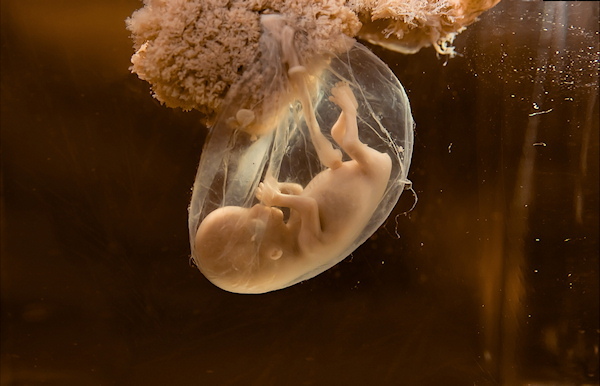 Second, unlike a zygote, an embryo, or a fetus, an acorn or any other seed is nothing like a human fetus. An acorn is more like a human egg. In order for the acorn to become a tree, germination must take place, just as in order for a human egg to become a human being, fertilization must take place. The comparison is therefore nonsense. As for the chicken egg, it is not a chicken, that’s true, just as a human egg is not a human being. After fertilization, a chicken egg becomes an unborn chicken and a human egg becomes an unborn human being. Human embryos, whether they are formed by fertilization (natural or in vitro) or by successful somatic-cell nuclear transfer (SCNT — i.e., cloning), do have the internal resources and active disposition to develop themselves to the mature stage of a human organism, requiring only a suitable environment and nutrition. In fact, scientists distinguish embryos from other cells or clusters of cells precisely by their self-directed, integral functioning — their organismal behavior. Thus, human embryos are what the embryology textbooks say they are, namely, human organisms — living individuals of the human species — at the earliest developmental stage. Science and advances in technology have been able to prove repeatedly that a fetus is in fact a separate life and a separate human being from his or her mother. A common pro-choice argument in response to this fact is that while the fetus is a human being, he or she is not legally a person and therefore is not entitled to the same rights that you and I enjoy – mainly the right to life. Human fetus at 7 weeks of development. Sound familiar? Pro-choicers hurl similar statements about unborn human beings every day. Despite knowing that fetuses are human beings, pro-choicers simply don’t believe they are human beings who are persons deserving of rights under our laws. They say that deaths of fetuses don’t matter and are therefore not murder. They say that since fetuses are inside the womb, they are parasites. They believe that fetuses are just tissue and cells. It’s important to note that these are just the subjective opinions of pro-choicers, not facts, just as pro-slavery beliefs were just opinions. None of the arguments are based on facts. Thankfully for African slaves, some Americans stood up for them and after decades of arguing and warfare, marches, and demonstrations, African-Americans finally received the rights that they deserve as human beings. It’s been over 35 years since Roe v. Wade, but we still have a long way to go to win the rights of unborn humans. But it will happen. Fetuses are human beings – this we know. But until our government recognizes them as persons, the war against legal abortion will not be won.